In this Artifact Art piece, a cowboy and horse scene is depicted on a Kitchen Cleaver alongside a genuine horseshoe. Both are mounted on a rough Redwood board. Add a small piece of the Old West to your kitchen! 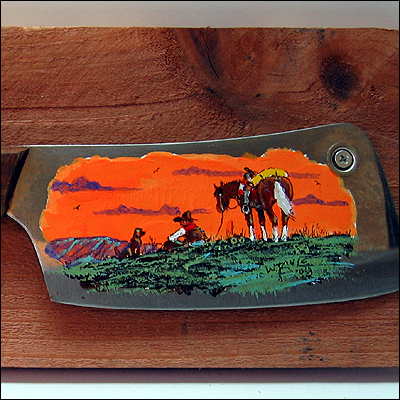 The Cleaver was an important implement used by all Chuckwagon cooks in the Old West. In fact, the cook (or "cookie" as they were often referred to), was often second in command right behind the "trailboss" on a cattle drive. The old horseshoe in this piece came from the John Wayne Ranch in Stanfield, Arizona -- not far from our home in Casa Grande, Arizona. This fact gives an added authenticity to the piece.